Verdict: The better of two poisons? Wales lost their opening Test in South Africa 38-16 after they were blown away by a rampant first-half display by the Springboks. 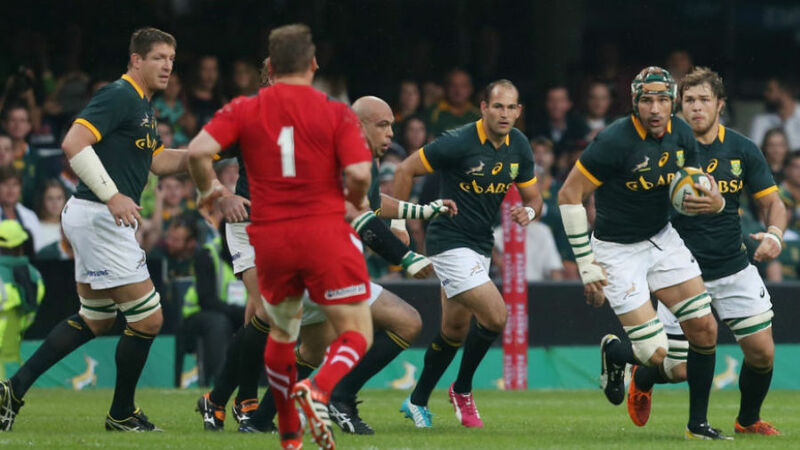 Bryan Habana crossed twice while Duane Vermulen and Willie le Roux also scored as South Africa hit Wales with four tries before half-time. Cornal Hendricks followed in the second half before Alex Cuthbert lit up King's Park with a blistering solo score to grab some consolation for a well-beaten Wales team. Earlier Gareth Davies had seen his try ruled out for a forward pass as Wales at least made a fist of the second period. But the damage had been done in the opening 40 minutes as South Africa built a 28-9 lead at half-time in Durban. It had looked set to be a different story from the opening exchanges when Wales got off to a flying start. Outside-half Dan Biggar kicked the tourists ahead with a third-minute drop-goal and they managed to move the ball wide to danger wings Cuthbert and George North in the opening exchanges. 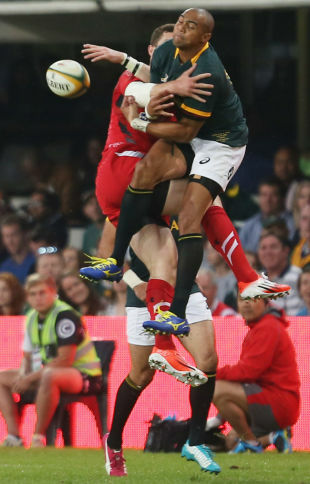 At the other end of the field, Wales managed to repel the first raid from the Springboks, but there was no stopping Habana, when he raced on to a chip ahead by outstanding full-back Le Roux, to notch his score. Morne Steyn added the conversion from close to the touchline to open a faultless display with the boot, kicking six from six in a 13-point haul. Welsh woes continued when Jamie Roberts was sent to the sin-bin after 13 minutes for taking out Le Roux in the air with a clumsy tackle after a Biggar up and under from a penalty. While the Racing Metro 92 centre was off the field the Boks added two more tries as they extended their lead to 21-6. Number eight Vermulen crashed over from close range in the 16th minute after a dynamic line-out peel five metres out. Steyn added the extras and did the same when Habana responded immediately to Biggar's second drop goal of the game midway through the first half. The magnificent Le Roux spotted a mismatch in midfield against Aaron Shingler to create the overlap for his wing who raced over for his 55th Test touchdown. That man Le Roux turned from provider to scorer just before the break as he chipped over the Welsh defensive line before re-gathering and riding North's tackle to reach the line. Steyn added a fourth conversion. Biggar ensured he had the first and last word of the half as he kicked a penalty to cut the gap to 19 points at the break after Bismarck du Plessis had been penalised. That was cancelled out early in the second half by Steyn before man of the match Le Roux set up the Springbok's fifth try on 52 minutes. JP Peterson went close before Le Roux switched direction, exploiting the lack of Welsh jerseys and new cap Hendricks stepped inside North to touch down on his Test debut. Trailing 38-6, Warren Gatland threw on his replacements who at least stemmed the tide. Ian Evans spilled an attacking lineout five metres from the line but replacement scrum-half Davies showed his potential, turning poor ball into attack. Davies darted through before off-loading to Biggar only for the return pass to be judged forward. Wales looked to have wasted their best chance before Cuthbert set off from his own 22-yard line, battling through three defenders before out-pacing three more, including Habana, for a stunning try that James Hook converted. A resilient try-line stand prevented a further score at the final whistle.